A High School filled with about 200 students with great potential but very little resources from which to work. With the addition of this school, ACF has taken-on a challenge that will be very rewarding with a bright future. The High School has a common use area for all activities. The concrete foundation was built by residents using boulders they hauled up from the river bed some 400 yards below the school. The classrooms are open air with no windows or doors. The students must carry their desks and chairs from room to room to participant in various subjects. ACF Trustee, Terry Minke unpacked suppliers presented to the school on our first visit. Their complete library consists of about 25-30 books. Books for their library is a priority. 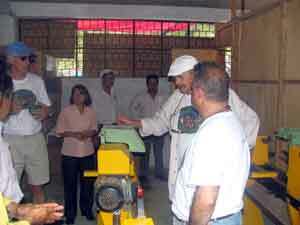 The school has received woodworking equipment for the wood shop which has not yet been constructed. They will need carpentry and woodworking skills training once the wood shop is complete.